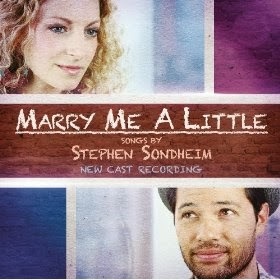 The cast album of last fall's off-Broadway "Marry Me a Little" is out! i LOVED the show when it played at the Clurman and went back twice. Friends, it's so, so good! I downloaded it last night from iTunes and cannot stop listening to it. I CANNOT STOP LISTENING! Gorgeous Lauren Molina sings "Her" and Jason Tam sings "Him" - they sing even better than they look. It's all easy on the senses. The piece is a sung-thru musical of rare and assorted Sondheim songs, a mix of numbers from rarely seen shows and pieces that never made the cut in popular shows. John Bell is the music director and robustly accompanies on piano. The album is released by Sh-K-Boom/Ghostlight and is a must have. Buy it via Sh-K-Boom's website, Amazon or iTunes. You'll love it!